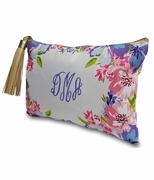 Embroidered Accessory Bag. 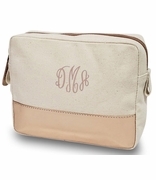 New this fall, stylish and trendy is this beautiful herringbone taupe and white embroidered accessory bag. 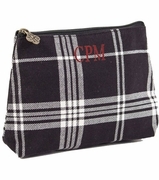 Large enough when going to the gym, vacation or travels to pack all bath and beauty products in one bag. Easy clean lightweight lining, with zipper closure. Need a matching set for yourself or for a gift, add our weekend tote bag by searching item WB-M445HTAUPE, or the personalized herring bone open tote item WB-M730-HTAUPE. 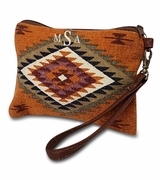 Embroidered accessory bag measures 11" x 8"" x 2".